The Azores is probably one of the lesser known places where bullfighting takes place but sadly the torture is very much the same as in Spain and other countries where this cruel blood “sport” takes place. Unbelievably this barbaric spectacle receives funding from the government. From February 24-26, 2014, a 3-day bullfighting event which is financially supported by the government – the “III Forum of taurine culture” – will be held in The Azores. Please urge officials not to spend public money on this barbaric bloodsport and call on sponsors of the event not to support such animal cruelty. 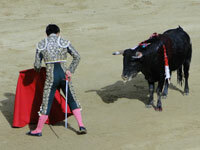 Say that you will be boycotting The Azores until a bullfighting ban is introduced.